Gardening can be a fairly low-key way of helping to keep yourself fit, as even the most gentle gardening will help you to exercise and get moving. Therefore, it follows that gardening to keep fit as a family must also be a good idea. However, it does not always seem that straightforward. For a start, children and teenagers may well see it as an uncool thing to do and older people may worry about the bending and kneeling they will have to do. But if you all work together on your garden as a family and all take responsibility, you can have a lovely family garden which everyone is interested in, and a garden which helps to keep everyone fit, even if it is only in the sense of getting them out of the house and actually doing something. Of course, the more active family members can be pressed into action by lifting and digging - for them, gardening really will be a workout. The problem with gardening and getting children involved is that it can take a long time to see the fruits of your labour - by which point young children may well have lost interest. So the way to keep them involved in the garden and keen to carry on helping out is to grow plants with them which bear fruit quickly - and ones which are edible so they can then go and eat their very own produce. Two of the most popular plants for growing with children because of these reasons are beans and tomatoes. As an added bonus, if the children have grown them themselves, they will be even more keen to eat the vegetables! Teenagers can be tricky to interest in gardening as it is certainly not seen as a cool thing to do. 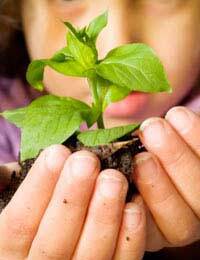 However, tap into their environmentally-friendly mindset and tell them they can be in charge of composting for those. Alternatively, give them a corner of the garden to do with as they please. Much like if they are given control of their bedroom decor, they will be far more likely to take pride in it and try to grow things in their patch. Older people who have reduced mobility may enjoy gardening but be worried about hurting or straining themselves. To solve this and still get them involved in the family garden, they can be in charge of potting or some other sedentary task. This way, they still get a chance to be involved with the family activity while being active, at least in a small way. Add to this the fact that if they have enjoyed gardening for a while they will probably be the person most knowledgeable about gardening and you have the perfect solution. Gardening really can be a family activity as there is something for everyone. And while there are also hard and boring tasks to do such as cutting the lawn, if they are interspersed with more fun activities, even the mundane things will be slightly more enjoyable.